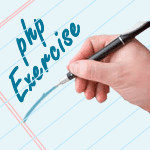 Write a PHP script to get the last occurred error. Note: error_get_last() function returns an associative array describing the last error with keys "type", "message", "file" and "line". If the error has been caused by a PHP internal function then the "message" begins with its name. Returns NULL if there hasn't been an error yet. Previous: Arithmetic operations on character variables : $d = 'A00'. Using this variable print the following numbers. Next: Write a PHP function to test whether a number is greater than 30, 20 or 10 using ternary operator.